Interests: Football, family and going football with my family! Tammy turns down wolves! 😱. Wait till the news comes out that fifa rejected the move. Wolves fan seems to have gone quiet haha. Not as quiet as it is in here today! I can not believe the club are turning their backs on Hutton. Most committed and underrated player we have. Best right back, best left back. always an out for the ball, and is genuinely our enforcer, never moans, from what I hear first at training, and last to leave. yet the club willing to turn back on him. Alan hutton is committed and he tackles like johnny giles chin up alan hutton. How long should we keep hutton his been good but his ageing Flackie not good enough for the premier league. So he isn’t good enough as a squad player? Whether you think him rubbish or not good enough he has earnt the right to be offered a contract, and whether he good enough, he is still the best at the club, on both flanks! I know what a surprise. Have we signed john terry or something? Not sure if we pay them, or they pay us. either way, it's a good deal. Most of the recycling is sent to china for reuse. Makes sense we start sending our rubbish (Richards) as well lol. Moyes pulls plug on Richards going to Sunderland. Perhaps Moyes knows more about football than I thought. I’m so gutted about hoddle, one of the best footballers I’ve ever seen, the best coach I’ve ever witnessed, and I great man. I wish him well, and his family and friends good news. Fantastic player to watch play the game with so much grace. Yay! That is exactly what the club and fans needed. Clear direction, clear leadership, and a manager that only has the club at heart. and maybe, just maybe, we will now see hogan shine. It's great appointment, in excited by this appointment up the villa, in not bothered if we don't go up this season because it's going to take a bit for new managers style to work think next season, we will be flying, I'm 1000 percent behind these 3 no moaning from me ha ha. Rogers says he not interested. How are you big man? Jesus, has he brought a season ticket at Villa? Personally I really hope the rumours are true. If an ex player like Henry can’t get our attack firing then I seriously don’t think anyone can, and we know that Terry will sort the defence out. I genuinely think that the goal keeper will be a great addition once there is a belief in what is in front of him. I agree with u Flaks. Do you think Terry will be a player/ Coach if rumours are true? Think Terry could well play with a bit of luck. Our defence really needs leadership at the back. We have a great goalie, but one who’s confidence is shot. He doesn’t become his country’s number 1 unless he is. A fractured defence has destroyed him. It could prove me wrong but to call him a "great goalkeeper""
Less than 20 games for us, do not change the fact that through his career he has been an exceptional keeper. Became his countries first choice, and raved from every where he has been a player. I agree his start has been less than great, but that’s to do with what is in front of him. Also, Johnston was not great in the start of his villa stint. Bob not sure if you remember I was saying the same thing to you a few weeks ago about our keeper. The guy needs time, he has no confidence in his defence, if they make a mistake he is left to cover, he makes a mistake it`s in the net. He will blossom with a decent back line. We will leave it there for now. I posted this in another thread, but it’s got lost with so many new posts, all good posts, that isn’t a criticism, before I’m jumped on! Just wanted to know if people agree with points made, and what their thoughts are! Personally I think we need to address what we want before we decide on who. Who ever we go for, I think they inherit the best squad that’s been at villa for years, and thankfully no one is running away with it yet. One more point, personally I wouldn’t be against sherwood coming back. but, the problem here is, he failed once, and if it didn’t work from match one, the boo boys, and press would be on his back straight away. Yeh I read it earlier mate. I think you make some good points, we really do need to get it right this time around. I think if you are coached football as it is meant to be played you do have a chance. Get someone in who works that way and I will be more than happy. If a boxer won`t throw a punch, he won`t win. As you say the squad is there already. Flackie, nice to see you back on here posting . I agree with what you say, but at the end of the day, even though e would like to, I can’t see us getting a say . You can bet the phones been red hot . We now have a different type of owners . Not saying that Dr T, didn’t have a genuine love of the club but he didn’t have the financial clout to carry it through . These new owners, it’s their money and not controlled by others . I still think this fair play ruling, may still have some say in who we can get . 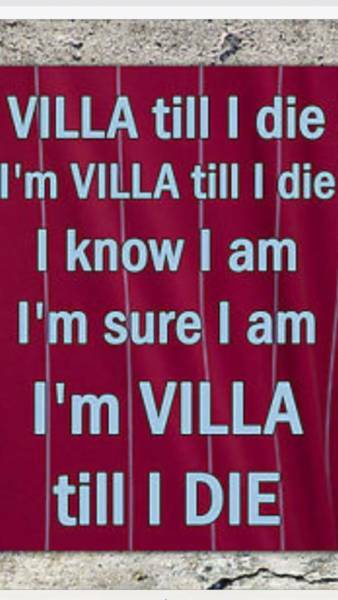 We just hope they make the right decision, the Villa plus our sanity depends on it . Once again, glad your posting again . I agree Dave, and that’s a great analogy. So where do you sit? What would you like, and who? We are still in touching distance. the right man now, and we will still win this division. Personally, I hope they get someone passionate about villa. I’d love Mellberg. Perhaps with petrov on the coaching staff. Flackie great shout, that would be a dream team, for all Villa fans . Even better, find a place for Larsen as defensive coach . Seems that Moyes is now the clear favourite? If you ask me now who is going to come here I would say Rogers. Bob, that’s the best post I’ve read of yours. Thinking about it, I’d love Rogers! But not sure he would want to leave a champions league club for a championship one. So for me Rodgers or Sherwood I'm 50/ 50 on. He had to be recalled by the 14th. He can’t have his loan cancelled now until end of season. Was a very satisfying result after the psis takes I got after sat! Lol. Ahh I see! It’s my genuine character flaw! I apologise guys! You guys looked superb tonight. well done, and good luck, genuinely hope you go all the way. Would love Tammy to score winner for you at Wembley. I hold no malice against a pro wanting to play in prem, wish it was for us! But right now your there, and we are not! He deserves the chance to prove him self. I hope he plays, and score siht loads for you. I’m confused why there seems ‘beef’ between wolves and villa last couple of years. Can you explain? We have no animosity towards you, and surely your efforts should be to the baggies? Yet we seem to be in the brain of all you guys recently. Why? Any way. good luck to you for the rest of season, good luck to Tammy, I thank you for your goals! Think it is on red button mate. 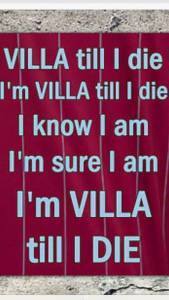 I don’t post on here personally any more Dave, as for me a certain few killed this site, this was for me the best villa fan forum, but certain posters killed that pleasure. Rarely come on here now, and obviously I’m not the only one. Great run, great result, let’s hope we keep it going. UTV. Had to read that a few times and get my head around it. That’s an all time low. The thing is, this isn’t the first time. Remember the guy running on to the pitch and having a pop at Enklemen? same ground, same mentality, same old excuses.